Breaking into the modeling industry can be challenging, whether you're looking for part-time work or a high-paying endorsement deal. One of the best ways to be scouted by an agency is to showcase what you have to offer. Our modeling resume templates make promoting yourself in an engaging way easy. In addition to a portfolio of photographs, a resume can catch the eye of a recruiter by detailing your prior jobs. Writing a resume is not as difficult as it initially appears. Completing it step-by-step through a template with a plethora of writing tips and examples by your side can make the process enjoyable. Armed with a good resume, you can be on front covers in no time. If you're interested, learn more and boost your chances of getting your dream job. Why Use Modeling Resume Templates? Taking shortcuts probably won't get past an experienced recruiter. The creators of our modeling resume templates are familiar with the features of a stellar resume and have incorporated all of them into the platform. You won't have to worry about technical formatting. Plus, you'll have access to phrases to use and writing suggestions to make your language sound professional. Make your document as dynamic as you are with one of our contemporary modeling resume templates. Layouts include headlines, columns, and teasers to make your message jump off the page. Modern and uniquely organized, a resume as cutting-edge as a trendy outfit can outdo your competitors any day. Some even have room for a small photo of your headshot. There are hundreds of modeling resume templates in our database. Which one to choose? Why not go with one of our popular options chosen by our editors and loved by jobseekers. These feature an eye-catching, traditional layout to make your accomplishments and experiences stand out. Carefully crafted by the experts, your resume is sure to turn out elegant and impressive. Modeling is a chance to express your creativity. Make your resume colorful, fun, and fancy with one of our many modeling resume templates designed for the art industry. They are available in every color of the rainbow and incorporate pictures, banners, and boldly outlined sections. One look at a visually grabbing resume and your name can skyrocket to the top of a call back list. If you prefer to go the traditional route, one of our clean modeling resume templates is right up your alley. Designed to be scannable, our designs make masterful use of white space, color, and typography to showcase your strengths. Professional looking but never boring, a clean resume is a great sign to recruiters that you're determined and prepared to strut your stuff in style. Bursting with ideas? 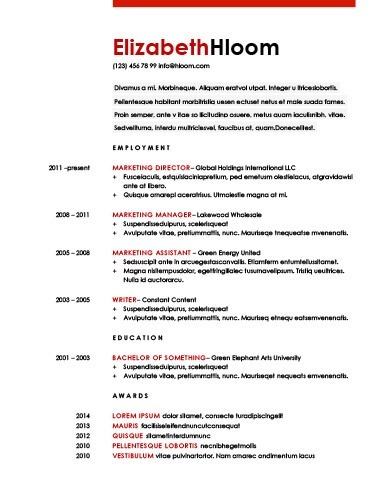 Stay within your limits by checking out our one-page modeling resume templates. Recruiters are often too busy to bother with anything longer than a single page. Our templates give you a streamlined way to present your information by making use of tricks such as columns and different sized fonts. Many jobseekers struggle with how to properly frame their professional skills and accomplishments. Apart from assisting with the layout of your resume, our modeling resume templates help you by giving you keywords and phrases to use in your document. These can be enormously helping when thinking about how to polish your language. Of course, there is a method to follow to make sure your resume hits all the marks recruiters want to see. Before printing or submitting your document, take a look at this checklist to make sure each section is as perfect as you can make it. Display your full name, phone number, and email somewhere at the top of the page. If you have a website illuminating your modeling portfolio, include that as well. List the city and state in which you live. You don't have to reveal your full address if you don't feel comfortable. Don't use a silly email address. Remain professional by creating an account with your full name. If you have a lot of industry experience, create a brief summary statement that points out your strongest skills, accomplishments, and experiences. Think carefully what recruiters consider most valuable. If you're transitioning from another industry or are looking for your first modeling job, an objective statement may be more appropriate. Express why you want the position and what talents you can offer recruiters. Don't be afraid to brag; this is your chance to shine! Read the job description to identify the most essential skills for the position. If there is no job description, do online research to identify what makes a successful model. Pay close attention to this section, since it's often considered the most important part of a resume. Choose at least two, but preferably three, prior positions that relate to the job you're applying to. Create between three and five bullet points for each position. Start each point with an action verb ("Modeled," "Sold," "Competed," for example) for readability. Keep each bullet point two lines or fewer to make your document easy to scan. While often not relevant for modeling positions, you can include a short education section if you wish. Make it relevant by including certificates or awards, such as modeling or acting classes, rather than academic achievements. Include any industry memberships or affiliations you're a part of. Another good approach is to list hobbies you enjoy.